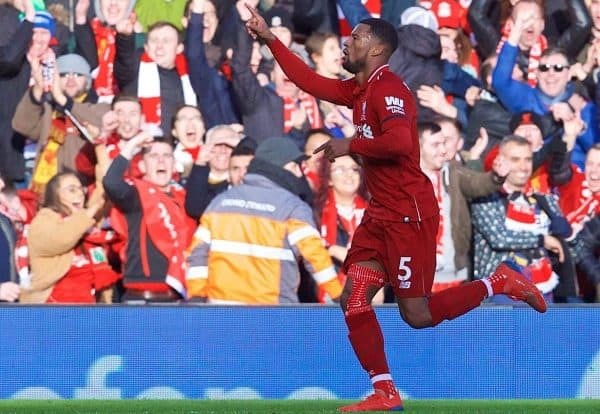 Liverpool returned to the top of the Premier League, and top form, as they sealed a comfortable 3-0 victory over Bournemouth at Anfield on Saturday afternoon. Speaking before the game, Klopp urged the Liverpool supporters to “shout your soul onto the pitch,” and taking to the field on Saturday his side were met with a brilliant atmosphere. The manager made just one change to the side that were held 1-1 by West Ham on Monday night, and it was a hugely positive one as Gini Wijnaldum came in for Adam Lallana, with James Milner retained at right-back. Victory was required after Man City leapfrogged the Reds at the top of the Premier League in midweek, and they made light work of Bournemouth to ensure this was the case. Liverpool took to the field in a 4-3-3 formation, with Fabinho, Wijnaldum and Naby Keita in midfield, Sadio Mane on the left, Mohamed Salah on the right and Roberto Firmino up front. Bournemouth started brightly, with Alisson forced to deny Ryan Fraser, but the Reds quickly assumed control with Mane and Keita interchanging and Salah taking charge in a free role, with the visitors required to defend well. 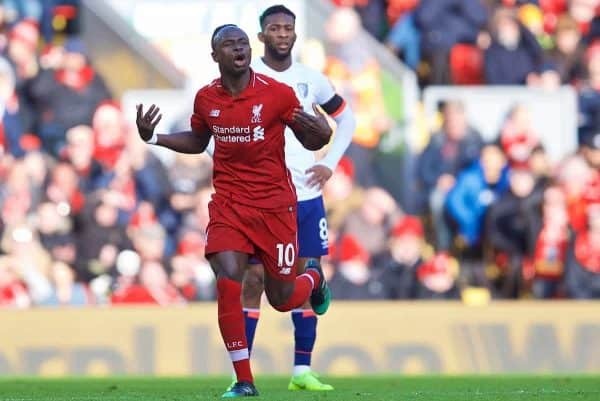 Their dominance paid off after just 24 minutes, as in the second phase of a corner, Milner delivered a perfect cross for Mane to power a header past Artur Boruc, scoring in a fourth consecutive Premier League game for the first time. With the wind in their sails it didn’t take long for Liverpool to grab another, and it came with a brilliant goal from Wijnaldum, latching onto Andy Robertson‘s pass and lobbing Boruc from inside the penalty area. Salah almost added a third with a sensational, off-the-cuff effort, but this time Boruc was a match, with a fine save keeping the score at 2-0 heading into the break. Not resting on their lead, Liverpool netted another within minutes of the restart, with Keita’s sumptuous pass finding Firmino behind the defence, and the striker’s backheel allowed Salah through to produce a brilliant finish. Truly finding their fluency, the Reds continued to open up their struggling opponents, and Wijnaldum almost set up Mane for his second header of the afternoon, but he nodded it hard into the ground and off target. The tempo dropped towards the final 20 minutes, but the backing from the Anfield crowd certainly did not, with Klopp’s call for support before the game paying off. 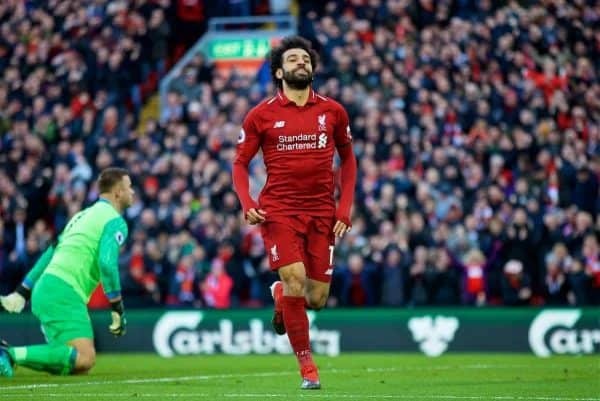 Salah struck the bar with a stunning effort, before the Kop erupted as Trent Alexander-Arnold made his return from injury, replacing Wijnaldum as the manager took a cautious approach with the pair after their injuries. Klopp used the final minutes to bring on Divock Origi and Daniel Sturridge and allow Mane and Firmino rest, and though the Reds enjoyed some excellent chances late on they were left to settle for a 3-0 victory.